Matta-Clark's origins in the practice of Surrealism are extensive and expansive. His father, Roberto Matta, was one of the foremost 20th Century practitioners of this mode of expression. His godfather was Marcel Duchamp with whom the family maintained close relations. His introduction to the artistic avant-garde began from his birth. 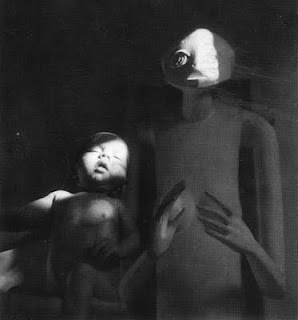 In this portrait of Gordon as a baby, he's held up beside Alberto Giacometti's Hands Holding the Void (1935) as if his life would be inspired by the spirit of that same void. 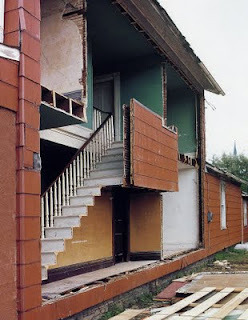 Bingo involved the removal of sections of the side of a suburban home based upon a nine-square grid. 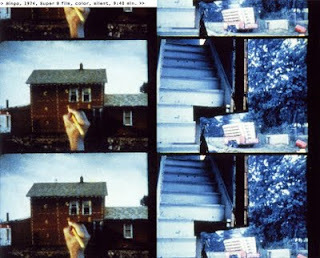 Matta-Clark's hands drawing and sectioning the design over a photograph of the house is featured in his film entitled Bingo X Ninths (9:40 minute, Super-8, color, silent, 1974). This approach to applying geometry to architecture functions on multiple levels. Architects would certainly recognize the use of a nine square grid as a standard organizational device. His modernist influenced architectural training at Cornell University would have certainly touched upon this mode of geometrical subdivision and could be considered a tool of the elitist architect. While Matta-Clark was likely highly conscious of this association to the traditional practice of architecture, but in particular its association with modernism and its application of abstract grids over the urban fabric. In a way, Bingo references this practice by demonstrating physically and metaphorically how the existing fabric of a community can be directly removed and erased. By using structures slated for demolition, he's effectively commenting on the tabula rasa approach employed in so many urban renewal projects. Simultaneously, Matta-Clark is referencing the gridded form of a bingo card, a common form in the life of American suburban culture. In slicing the wall of this home in rectangular sections he reveals the inner life of the home, exposing it to the voyeuristic eye implemented of the camera (still and moving). His sectioning of the facade drawn on a photograph is transferred to the building site itself and he removes one section after another, leaving the center in place. The apparently floating, unsupported slab of the wall is further detached from the house when a section of the staircase itself is removed. The cantilevered portion of the central remaining portion of the facade suggests several interpretations. First, it brings to mind the modernist trope of suspending architectural elements in the air that appear to float in space. The manner in which half of the wood staircase was removed further isolates this element. Matta-Clark was conscious of the structural conditions and incorporated them into his "virtual board game." The potentially dangerous game he plays with seeing how far he can go removing elements of the structure without incurring a collapse is a significant factor in appreciating the layout, planning and execution of the incisions. Where a board game is played on the flat horizontal surface, Matta-Clark creates a sort of billboard-like architectural analogue to game playing. A further connection with play is the tradition in the game of Bingo of providing a central red square as a free space. 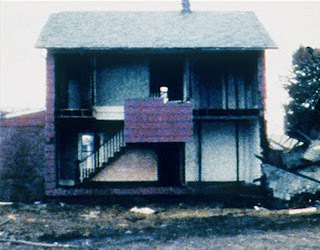 A text panel in the film documenting the project explains that the removal of panels was accomplished one hour prior to the house's demolition. The end of the film features a bulldozer destroying the house in its entirety leaving the site a void. Following is a video presenting the installation of a section of Bingo being installed at The Pulitzer Foundation for the Arts in October 2009.